How much do you know about COPD? For one thing, it’s a killer. In fact, it’s the third leading cause of death in the United States. Nearly 16 million Americans have COPD, but many more have it and haven’t be diagnosed, which pushes the estimate closer to 30 million. That’s because 50 percent of people who have it don’t know they do. Chronic obstructive pulmonary disease, or COPD, is actually an umbrella term for a group of progressive lung diseases that includes emphysema, chronic bronchitis and non-reversible asthma. With emphysema, the walls between the air sacs in the lungs are damaged, affecting the oxygen/carbon dioxide exchange and the amount of oxygen that gets into the bloodstream. Chronic bronchitis is the constant irritation and inflammation of the lining of the airways. Asthma is a chronic lung disease that inflames and narrows the airways. COPD symptoms most often appear in people who are 40 and older. There are, however, certain cases in which it develops in younger people. An example is the genetic condition called alpha-1 antitrypsin (AAT) deficiency. AAT is a protein, and low levels of it can lead to COPD, especially if you are exposed to lung irritants such as cigarette smoke or chemical fumes. Generally, COPD is not diagnosed until it is in an advanced stage. That’s mostly because people don’t recognize the early warning signs, or they attribute the coughing, shortness of breath and breathing difficulties they feel to a normal part of aging. 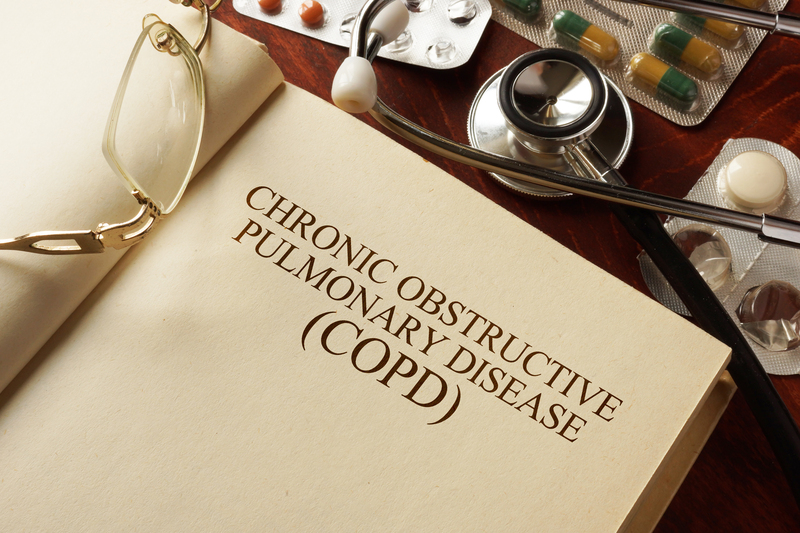 Also, COPD can be developing for years without noticeable symptoms. Other symptoms you may recognize include the inability to perform basic activities due to shortness of breath, the presence of a lot of mucus when coughing, a wheezing or whistling sound when breathing and tightness in the chest. There are additional, more serious COPD symptoms such as swelling in the ankles, feet or legs; weight loss; and lower muscle endurance. If you are experiencing a fast heartbeat, decreased mental alertness, trouble catching your breath when talking, or discoloration of the lips or fingernails, you need immediate medical attention. Long-term exposure to lung irritants is the cause of most cases of COPD, about 75 percent of them, and inhaled cigarette smoke is the most common culprit. Secondhand smoke also contributes to the development of COPD, as do air pollution, chemical fumes and dusts, both from the environment and from the workplace. COPD is most common in current and former smokers. It’s estimated that smoking is responsible for nine out ten COPD-related deaths. Smoking is harmful to the whole body, but especially the lungs by causing inflammation and destroying the lungs’ air sacs. This damage in the lungs is irreversible, but steps can be taken to manage and slow the progression of COPD. Treatment often starts by making lifestyle changes, such as quitting smoking and avoiding other lung irritants, following a healthy diet and finding a physical activity that strengthens the muscles that help you breathe. Your doctor may also recommend pulmonary rehabilitation. This is a guided program that includes exercise, disease management training, and nutritional and psychological counseling. The goal of pulmonary rehabilitation is to help you stay active and able to perform your daily activities. If you have a low level of oxygen in your blood, you may be placed on oxygen therapy. With this treatment, supplemental oxygen is delivered through the nose. Another way to improve breathing is by using bronchodilators, with or without inhaled corticosteroids. Bronchodilators relax the muscles around your airway, which helps open them up and make breathing easier. Staying healthy overall is important, too. Disorders such as pneumonia and flu can lead to serious problems for people with COPD. Follow your doctor’s recommendations about getting the flu shot and pneumococcal vaccine to help avoid these conditions and their complications. Stay healthy and breathe deeply!